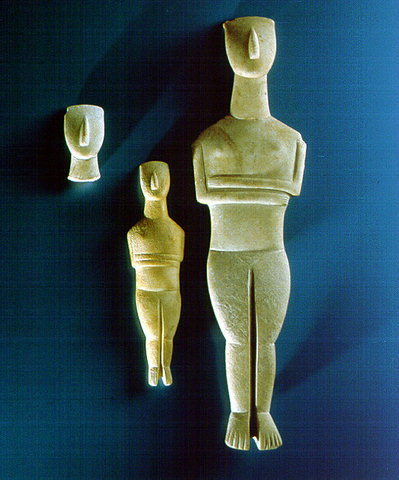 Syros,Cyclades Form: These marble sculptures of women vary in size from very small to life size. They are stylized much in the same way the "Venus of Willendorf" is. The essential forms are emphasized while other elements are de-emphasized. These figures were probably painted. Like the "Venus," the arms are engaged against the body, most likely to compensate for the marble's lack tensile strength or flexibility. 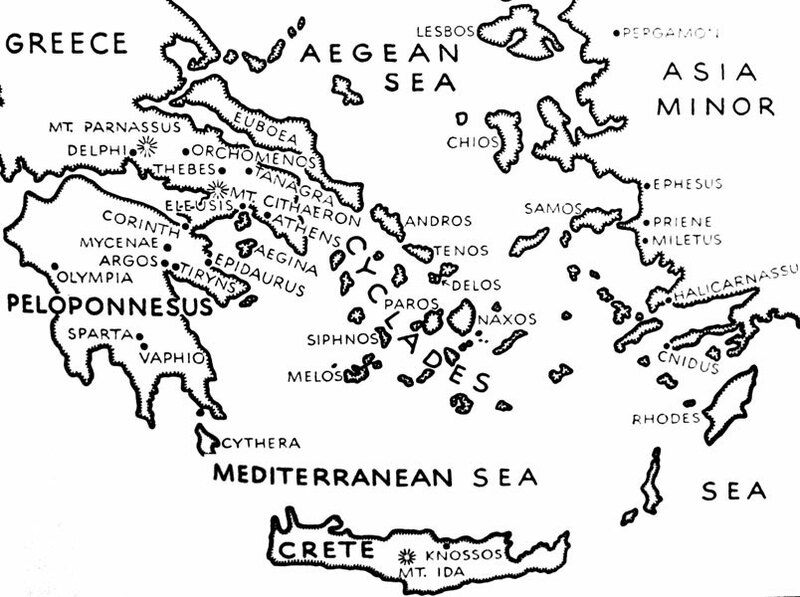 Iconography: The majority of such figures found are female. 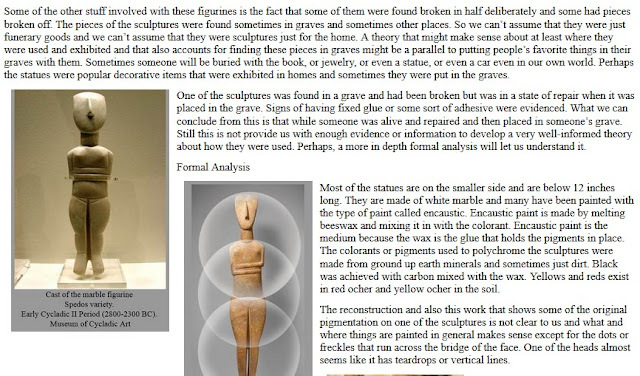 It is not really known what these figures may have meant to the people who made them but many seem to have used them as gravemarkers. It is possible that they represent idealized versions of the individuals whose graves they mark. The body types: usually thin with small breasts and thin hips are stylized versions of the female form. 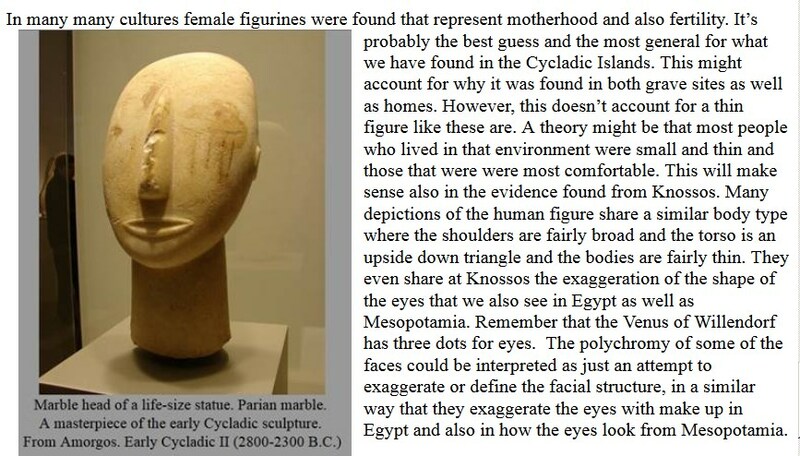 Possibly they are idealized forms in the same way that the statue found at Willendorf is. Context: It is believed that they were votive figures or funerary offerings. The marble quarries where the material for these statues was found are the same quarries where later Greek artists found the marble blocks for their master pieces. These pieces were carved with obsidian and polished with stones of emery. 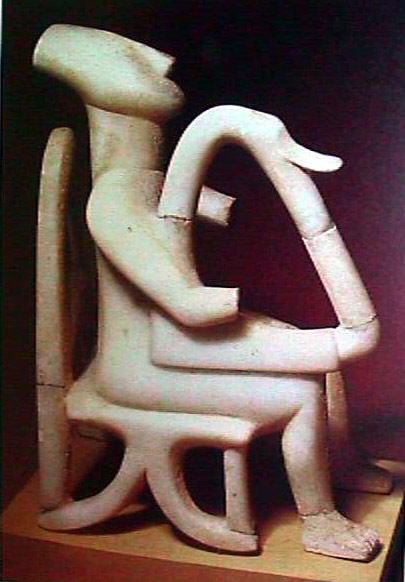 Keros Cyclades Form: This stylized male figure is sitting on a chair playing a lyre. It is very stylized and about 9" high. It is a sculpture in the round. Iconography: The meaning of such a figure is still unknown. Gardner's "Art Through the Ages" suggests that these may be representations of the god Apollo. Perhaps as a votive figure. 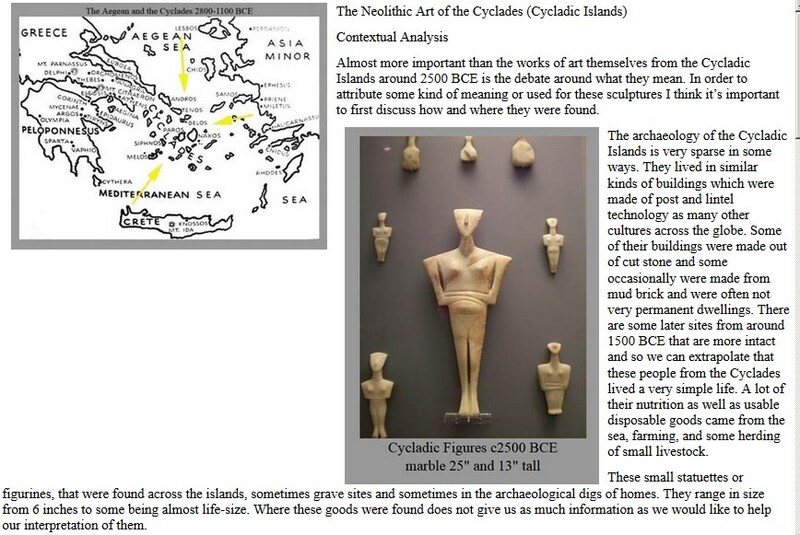 Context: This figure may also have been a funerary offering, someone to play for the dead in the after life. Some have been found in females' graves and this indicates that they may have been offerings for the dead. Some have been found in a different context. 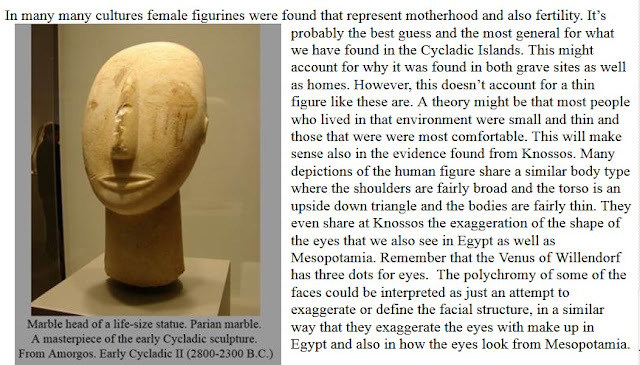 Stokstad suggests that the larger versions may have been used as parts of groups of statues for worship.